If you take a quick look at a large-scale map it appears like it might be possible to drive cross-country to Labrador from the end of the Trans-Taiga Road. And it doesn't even look to be that far! However, such a journey is not possible, not even with an ATV. The maps below show why. There are endless lakes, ponds, rivers and bogs. Most of the land is forested and rocky. There is extensive muskeg and bogs in low-lying areas. The land is very lumpy and hilly. 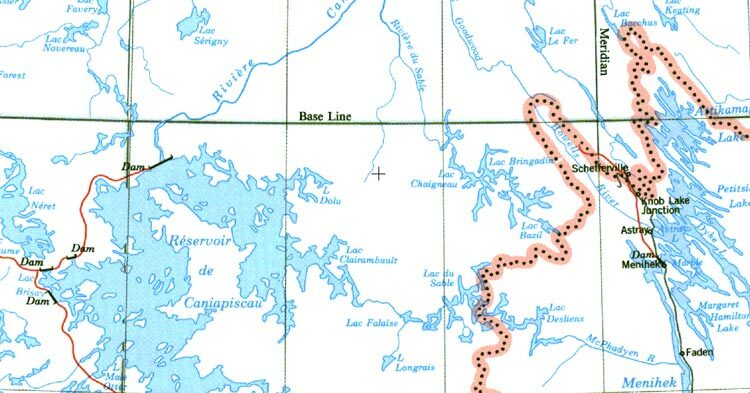 Even if such a journey were possible, it is 190km in a straight line from the end of the Trans-Taiga Road to Shefferville (which although technically in Quebec, is often regarded as being in Labrador). And there is no road from Shefferville to the outside world, just a railway. Maybe someday such a road connection will be built, but I think it is unlikely. The Trans-Taiga Road was not built for tourists. It was built by Hydro Quebec solely for the purpose of building and maintaining its dams and generating stations in the area.